If you love making homemade treats as gifts for your friends and family these DIY hot cocoa mix ornaments are a cute way to help someone warm up over a mug of hot chocolate. Consider pairing one of these hot cocoa mix ornaments with a mug for a great gift, or gather several of these hot cocoa mix ornaments on a tray to serve at your next winter party. It also makes a wonderful party favor to give to guests. To start remove the metal top off of the plastic ornament. Make sure the interior of the ornament is clean, it might be necessary to wash out the ornament to clean out any dust that might have been inside. If you need to clean the ornament allow it to dry completely. Insert a small funnel into the to the top opening of the ornament and pour the pouch of instant hot chocolate or 3 to 4 tablespoons of instant hot chocolate mix into the bottom of the ornament. While milk chocolate is a popular flavor of hot chocolate, other options such as mint chocolate, white chocolate, Mexican chocolate or even dark hot chocolate are also popular alternative flavors. The hot chocolate mixture should fill half to 3/4 of the empty plastic ornament. Next, if you wish to add colored sprinkles, such as red and green or mini chocolate chips do this next by pouring them down the funnel. Make sure to leave a small amount of space at the top of the ornament for some marshmallows. Add the mini marshmallows inside the ornament. Depending on the size of your marshmallows it may be easier to remove the funnel and drop them into the ornament by hand one by one. Finally, put the top back on the ornament by squeezing the two metal prongs together and slide them into the top of the ornament. Secure the ornament top by lightly pushing it down on all sides. 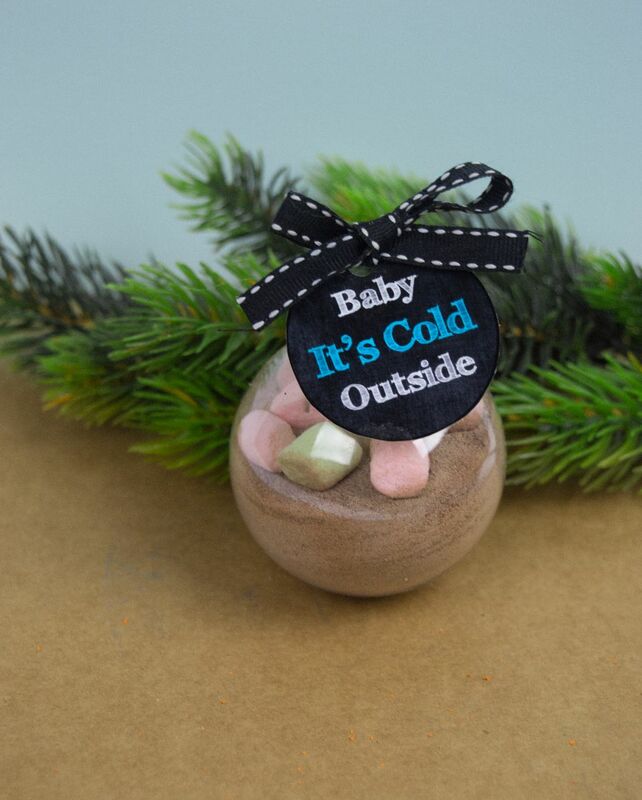 To finish off your hot cocoa mix ornament print the small round tags that say baby" it's cold" and cut out one tag per ornament you are making with a pair of scissors. Using a single hole punch make a hole at the top of the cut tags. Cut a small length of decorative ribbon that is 3 to 4 inches long and string the ribbon through the hole in the top of the tag and through the top loop of the ornament. Tie the ends of the ribbon together with a knot. The ornaments are ready to be given out as a gift, and once the hot chocolate has been drunk it is possible to clean the ornament and re-use it. While storing, your prepared hot cocoa mix ornaments make sure to carefully store them upright, which might require them to lean on something so that the layered chocolate and marshmallows get stirred around as it will look nicer with clean layers.